The SE14 is the perfect device for all workshops that vent and bleed hydraulic brake and clutch systems ? and for those who set value on durability, reliability and convenient handling. The device can easily be operated by one person The brake fluid change is quick and easy. The complete vent and bleed of the system ensures functional reliability of ABS, ESP, EDS, SBC systems and clutches. The integrated shut-off valve allows a leakage test to be performed after repair of the brake or clutch system. Low level buzzer / automatic shut down means there is no risk of air getting into the system. The integrated 19 litre steel tank can be filled with up to 15 litres of brake fluid. A screen fitting inside the tank nozzle keeps dirt and debris out. The device pumps the brake fluid from the tank into the master cylinder fluid reservoir fitted with a special quick-lock adapter. When the electric pump is activated, the pressure in the tank is built up slowly to prevent the brake fluid from churning. 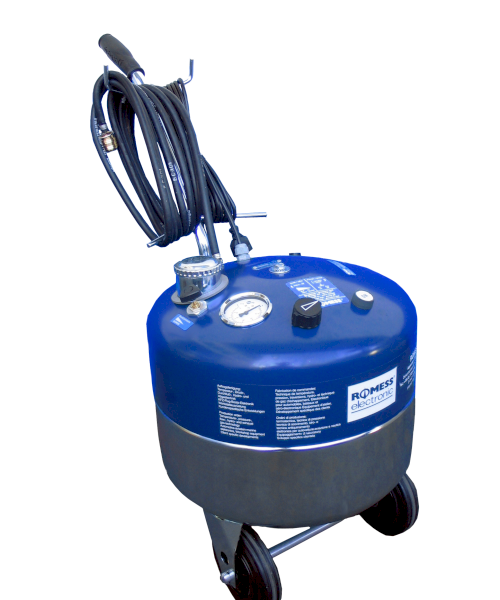 The flow oscillates to flush and vent even the smallest air and moisture locks or dirt and debris out of the hydraulic system to ensure a complete flush and bleed. Once the process is complete and the pump is turned off, the built up pressure escapes through the integrated re-circulation system and the fluid level inside the reservoir adjusts itself accordingly.Once the pressure has fallen to 0bar/psi, the quick-lock coupling can be disconnected from the adapter without risk of spilling brake fluid. The 3.5m long flexible hose offers plenty of room to change brake fluid up on a car lift. Refill without disconnecting from vehicle. The fluid level inside the main tank is monitored by a floater valve. When the tank reaches the minimum fluid level of 1.5 litres, the pump automatically shuts off to avoid air being inadvertently pumped into the hydraulic system. The shut-off is indicated by the red control light. It is not necessary to disconnect the device from the vehicle to refill the tank because there is no air in the line. After re-filling with brake fluid, the pump can be started again and the process can continue.